The mango is a tropical fruit that is identified with the Indian subcontinent. Bestowed the title of King of Fruits, the mango is the national fruit of India with over a hundred varieties grown here. The mango season begins mid-May to mid-June. Goa has its share of favourites such as mankurad, alfonso, fernandin, hilario and others. The fruit is eaten in its unripe or ripe form and raw or cooked, depending on the type of mango. Mango pickles and mango jam (mangada) are very popular. Before the advent of toothbrushes and toothpaste, tender mango leaves were used to clean ones teeth in Goa. Dried mango seeds and skin are used in Ayurveda. The oils in the skin, sap, leaves and stem can cause dermatitis and severe allergic reaction in some individuals. Mangoes contain a considerable amount of vitamin A and can prevent dry eyes and night blindness besides helping maintain good eyesight. The antioxidant compounds in mangoes can ward off cancer of the breast, colon and prostate as well as leukaemia. The potassium in mangoes helps control heart rate and blood pressure. The presence of pectin, vitamin A and fibre can lower LDL (Low-Density Lipoprotein) levels in the body. They are a good source of B-6 which enables the production of GABA (Gamma Aminobutyric Acid), an inhibitory neurotransmitter that is involved in controlling depression and anxiety in individuals. Since mango is a good source of vitamin A, it replenishes the skin on consumption. Thin slices of mango may be placed on the skin for 10-15 minutes to unclog pores. Tartaric acid, malic acid and citric acid in mangoes helps maintain the alkali levels in the body. Mangoes are rich in nutrients, especially vitamin C, and so they boost immunity. Their fibrous nature also aids digestion and increases metabolic activity and thus helps weight loss. About five or six mango leaves can be boiled, left to soak overnight and strained to give you a drink that can regulate insulin levels. They are rich in iron and are good for people suffering from anaemia. 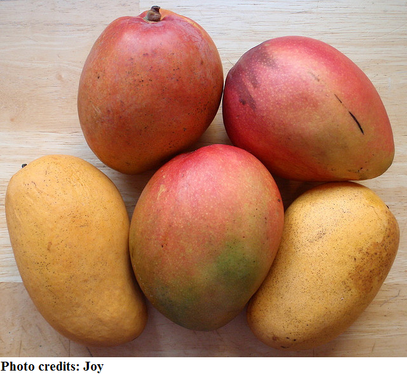 Copper in mangoes is necessary for the generation of red blood cells. Soften raw mango in a pressure cooker. After cooling separate the pulp and strain it. Add black salt, cumin (jeera), cardamom and jaggery and stir well. Dilute with water and serve chilled with ice cubes. Ingredients: 2 cups of chopped raw papaya, 1 tbsp of sunflower or coconut oil, ¼ tsp of mustard seeds, ¼ tsp of turmeric powder, 2 pinches of asafoetida, ½ cup of grated coconut, 1 red chilli, salt and sugar. Preparation: Cut the papaya into ½ inch pieces. Heat a tbsp of oil in a non-stick deep frying pan and when it is hot add mustard seeds, asafoetida, turmeric powder and small pieces of chilli. Add papaya to the frying pan. Put in the pan half a cup of water, sugar and salt for taste. Cook it till water disappears and garnish it with grated coconut. Ingredients: 1 cup of Goan beans, 1 tsp of cumin seeds, 1 tsp of coriander seeds, ½ inch of cinnamon, 8 cloves, ½ tsp mace powder, 1- 1 and1/2 cup of coconut paste,1/2 tsp of aniseed, ½ tsp of chilli powder, ¼ tsp of mustard seeds, 1 tbsp of sunflower or coconut oil, salt and sugar. Preparation: Keep the beans immersed in water for 4-5 hours and then cook well. Roast cumin seeds, coriander seeds, cinnamon, cloves, mace and chilli powder together and grind to form a paste. Heat oil in a non-stick deep frying pan and add mustard seeds, followed by the paste mentioned before, coconut paste and beans. Add sugar and salt as per taste and 2 cups of water. Cook for ten minutes. For cardiac pain, cold, influenza and low blood pressure: Two drops of tulsi oil mixed with one teaspoon of pure honey once a day for thirty days. Later take it twice or thrice a week for 6 months. Continue if required. For body odour: one drop of tulsi oil should be mixed in one teacup of water and consumed every morning for thirty days. Avoid meat and other food that is rich in protein during this time.